Seventh and eighth graders at St. Joseph's Academy, located at 53 East Jefferson Street in Downtown Orlando, Florida, in 1928. St. Joseph's Academy opened on October 17, 1889, with just 40 students. The school, built by Father J. J. Creed of St. James Cathedral, was to serve the children of St. James Church until 1929, when a new Italian Renaissance-style school was opened at 505 East Ridgewood Street between Cathcart Avenue and Hillman Avenue. The school stood at the northeast corner of the church property at Main Street and Robinson Street, where the U.S. Post Office now stands in Downtown Orlando on 51 East Jefferson Street. Students photographed include, from left to right, in the top row: Frank Yochum, Al Shepp, Mark Lambert, Ed Cavanaugh, Leonard Bumby, Gilmore Mac Carvel, Art Jane, Hilary Lyons, Mary Mickler, Arnold Mickler, and Frank Consonni. The second row shows an unidentified student, Alice Shore, Mildred McFarland, two unidentified students, Margaret Horan, and another unidentified student. Photographed in the bottom row are Henry Manhart, Charles Spellman, Lyons, Agnes Marsh, Becky Bumby, Catherine Cunningham, an unidentified student, Rose Rizk, Rita Girouard, Victoria Rizk, Codner, an unidentified student, Harold Young, and an unidentified student. Original 8 x 5 inch black and white photograph, 1928: Orlando Remembered Exhibit, Downtown Orlando Post Office, Downtown Orlando, Florida. Digital reproduction of original 8 x 5 inch black and white photograph, 1928. St. James Local History, "St. James Pioneer days, Parish and school reunion" October 5-6, 1974. St. James Roman Catholic church, "The st. James Story" Orlando Fl. St. James Pioneer Days: Parish & School Reunion : October 5-6, 1974. [Orlando, Fla.]: [St. James Parish], 1974. "About Us." St. James Cathedral. http://www.stjamesorlando.org/about-us/. St. Joseph's Academy . 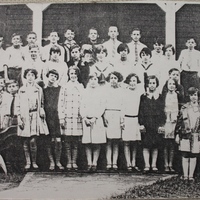 “Seventh and Eighth Graders at St. Joseph's Academy, 1928.” RICHES of Central Florida accessed April 21, 2019, https://richesmi.cah.ucf.edu/omeka/items/show/5556.